Get ready for the diss of the century! Tons of hot trance has been flowing out of the Netherlands since the 1990s. It's becoming their greatest export, putting potted tulips to shame. One member of the coveted trance family that's been riding the waves of success is Ferry Corsten, whose ever-changing sound has been keeping up with the times while simultaneously avoiding sounding like everyone else and still managing to raise many hands to the roof. But not all of his productions are wonderful, as evidenced by "Diss! ", a song quoted as being an "insanely big track" in its promotion. It's big all right... a big pain in the neck, that is! Luckily, the package is only one track long. The Original Mix is about all I can handle. Right from the get-go, I get a headache from this song. This doesn't happen with other songs, but the strange overbearingly loud mastering of some guy yelling "Come on!" is grating on the temples. I had to listen to this again for reviewing purposes, and it actually happened again. I had to seriously turn this one down so I wouldn't have to down ibuprofen like Pez. The song doesn't actually gain any actual substance until around 1:37 after what seemed like an eternity of poofs and shouts that weren't actually a song. A rolling bassline kicks in, and my hopes soared. Diss! features a very simple beeping melody that is easily remembered but lacks much ingenuity. 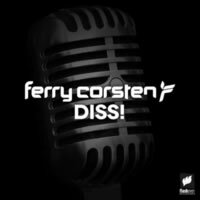 Ferry Corsten pounds it into us using a more powerful saw synth that adds a decent level of power, but he barely uses it before heading back into the "meh" territory from before. It's lackluster, to say the least, and to top it off, a breakdown of wacky weird zips and poofs starts another minute and a half before the end, making the actual meat of this track constitute about 50% of it at best. As a lovely gift (or poop in a bag, depending on your perspective), this track also received a free remix via SoundCloud. The Boyan & Boyer Remix tries to add some extra electro funk to the mix, and it ends up completely lapping the original in listenability and enjoyability. Using the hardest bass synths they could dig up, alongside a few other epic and frightening sound effects, this is the Chef Boyer-dee of remixes: it barely resembles the food it's based off of, but you still down it in meaty clusters. Unfortunately, this wasn't part of the original release, so it isn't a factor in the final score. That's a shame because it would have raised it significantly. Diss! is a very poor showing from a producer who's had a solid history of great hits in the past. Maybe that's why it's called "Diss! ": because Ferry knew that we would be bringing this sad excuse of a track down. You can do better, man. Get on it.